I ended up going with the watercolors for the studio. This is the first run through and I imagine that this week I’ll refine it with shadowing. Most of the yard is wooded so I do need to add more. I tried to keep the charm of the setting by keeping it simple. Next weekend I am participating in a studio tour. Not in my studio, mind you, but I will be taking some of my pieces to set up with another artist who has graciously agreed to host me at her place. This will be my first outing in quite a few years so I have had to put on my thinking cap and remember what I might need. I have been gathering up everything I can think of and will be taking my ornaments, note cards, gift tags, bookmarks, and some architectural work. I may paint more stone paperweights this week if I get the chance. Lots of price points is always important. This took me two days to ink. Yesterday, I stopped with the foliage about 2/3 done. I hadn’t quite decided how to finish the lower right corner and the background trees and didn’t want to overdo it. The studio is stuccoed so there won’t be much texture until I color it. The azaleas were in bloom so there will be lots of red, pink and white flowers. I am pretty happy with the positive/negative balance, although I may add a small amount more in the lower right quadrant. I am still up min the air as to whether I will use the watercolors or the pastels. I have to decide for both studios now, so it is a bigger decision than normal. The pastels will be a richer, deeper color and the watercolors more light and airy. Suggestions? Once again we have been out of town for a bit. This time we went to Atlanta to visit a close family friend who is ill. She is a rather famous Atlanta artist and we have been doing some work on her home off and on since her husband of 60 years passed away last summer, around the same time as my father did. 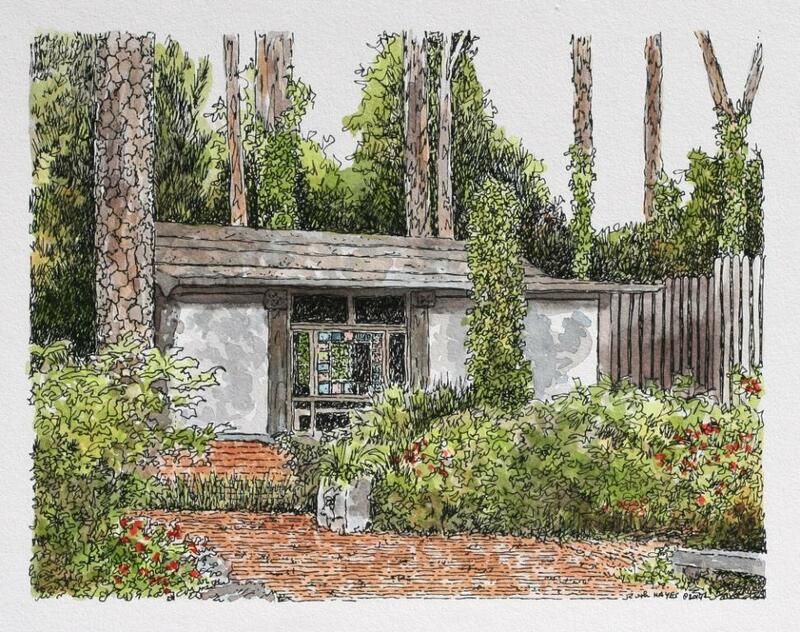 Many years ago, her husband built two work studios for her printing presses, nestled in their large wooded back yard. The area is also landscaped so beautifully that at one time it was featured in a magazine. There are so many different types of plants and flowers that I could never hope to identify them all. I can recognize the azaleas and the roses, the pines and the crepe myrtles, and the daffodils and wisteria, but that’s about my limit. There are wonderful brick walkways and concrete patios interspersed with the the plantings. Any place you might sit has a wonderful view. 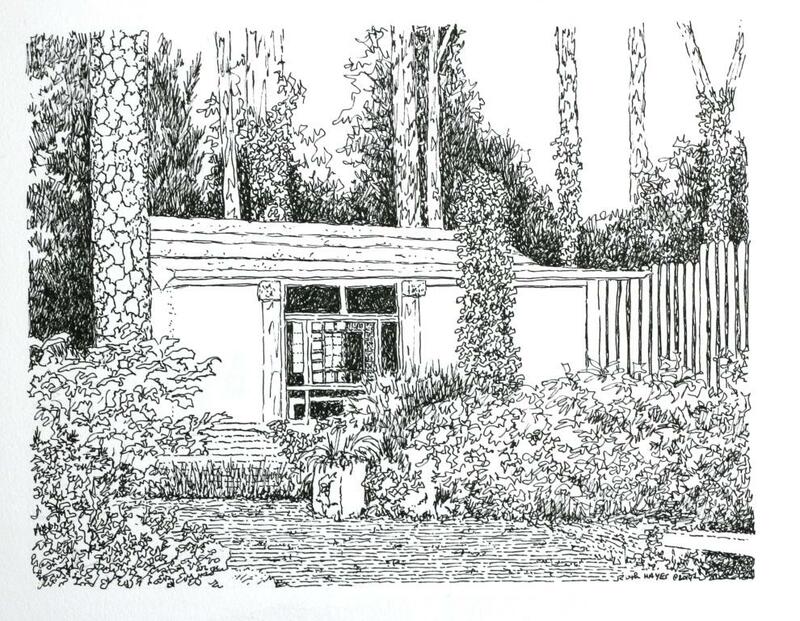 I always loved her studios and thought that someday I would draw them. I guess the time is now, while I have the chance. I took a bunch of photos when we were there last week. This one is wood framed and stuccoed, with timbered trusses. John grew up right next door and actually helped Bob build the structure. I think that started John’s love of timber framing so many years ago. I haven’t decided whether I will use watercolors or pastels over the ink yet. Inking will start tomorrow so I will have a few days to decide. 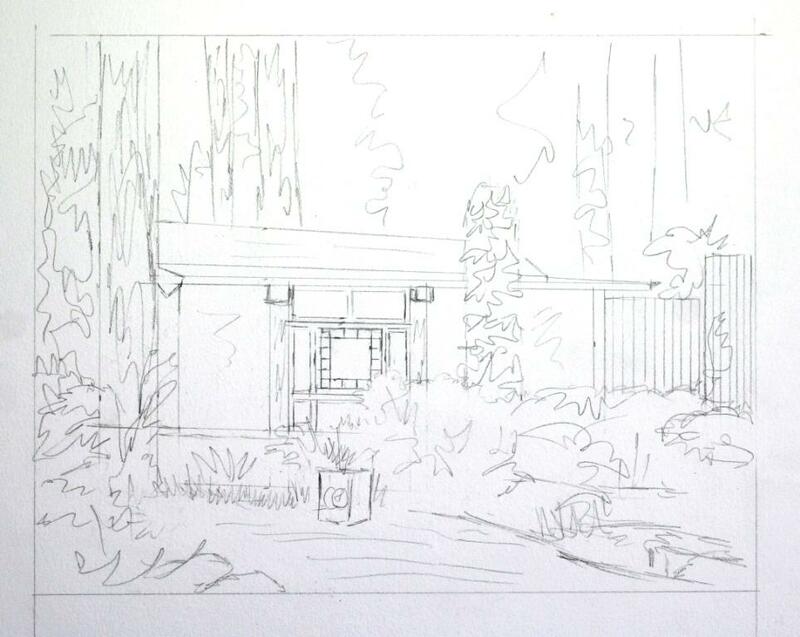 I am keeping the drawings small scale to reflect the intimacy of the setting. They are about the same size, sitting side by side in the yard. 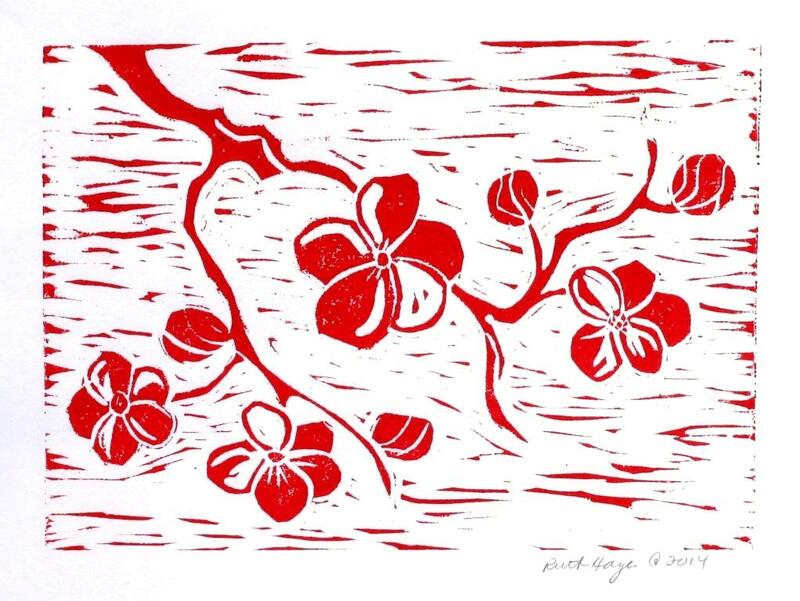 Thursday, I printed up the dogwood linocut with my red ink. If you remember, I considered adding some white to the red to vary the color. However, that would require that I had some white. I thought I did, but I did’t. So much for that idea. Anyway, I am not unhappy with the solid red. It is quite vibrant in its own right. I am thinking of making a companion print for this since I don’t think I’ll make one with the added watercolors. I’ll have to think about another red flower to use. 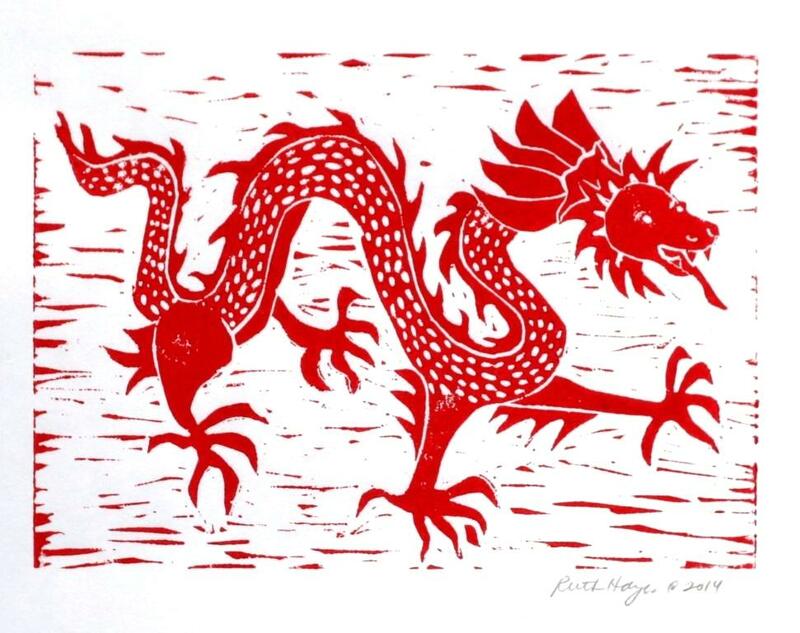 Or maybe I’ll print up the dragon in red. 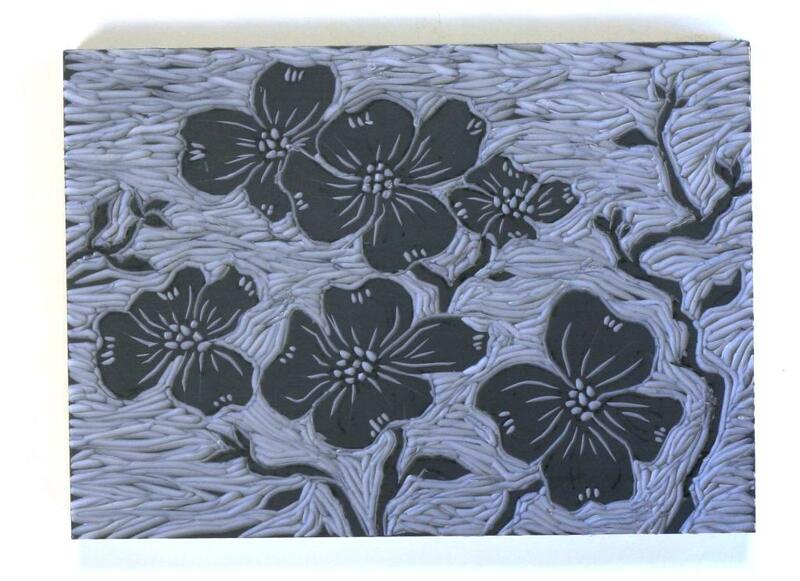 Take a peek at my etsy store linocuts and please make a suggestion for a different color for the black ones. In the blush of the first warm temperatures of the season, my daffodils have finally started to bloom. We are in for a lot of rain over the next couple of days, so I expect that the under story in the woods and the rest of the wild flowers will burst onto the scene very quickly. It is already late into spring for most of them to make their appearances. Right now it is thundering outside and the rain is sheeting down. With the droughts of the last several years, I am not going to complain. Any rain is good rain for us. 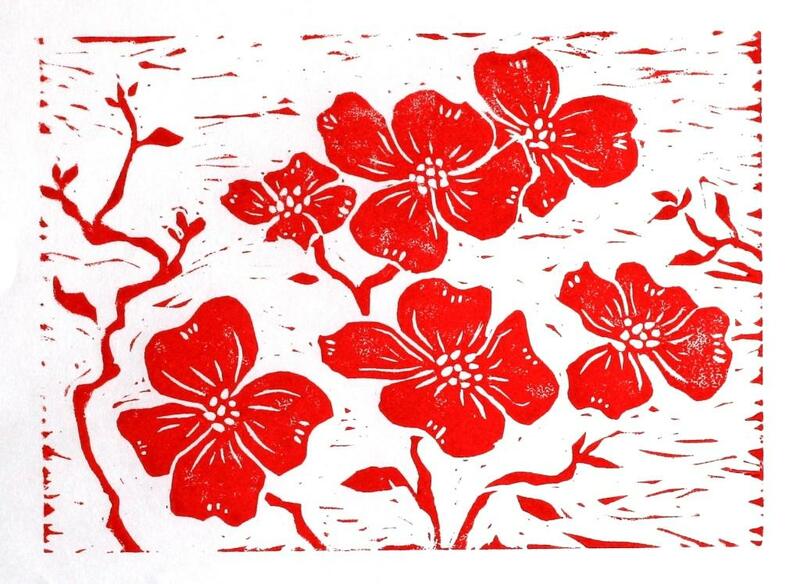 I decided to make a dogwood linocut today, in honor of my mangled little red dogwood tree. One of the deer thought that all of the flower buds on it, except for one, would make for a nice snack. Alas, it will be next year before I can see the red blooms again. I have had quite a hard time keeping a red dogwood alive and growing in this particular spot. I am thinking that I will print this in reds and pinks with the variation directly on the brayer. I’ve only tried that once before with some green and yellow inks. This one might be a good one to try it again. I don’t plan to make one to watercolor then unless I decide a green background would add to it. I think I need to see it first.